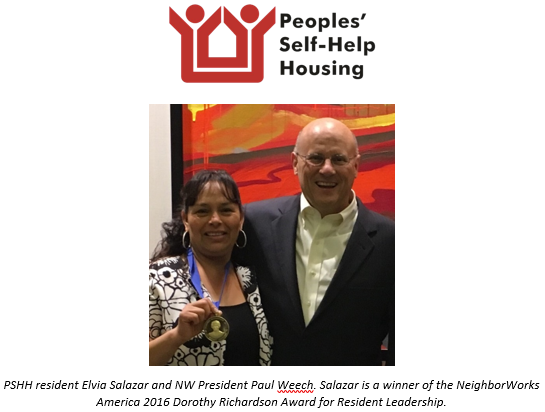 Santa Barbara County, Calif., Nov. 21, 2016 – People’s Self Help Housing is proud to announce that one of its residents, Elvia Salazar, has been selected as one of eight winners of the NeighborWorks America 2016 Dorothy Richardson Award for Resident Leadership. A longtime resident of PSHH’s Los Adobes de Maria II (LADM II) property in Santa Maria, Salazar has created positive change since she moved to the United States from Mexico 12 years ago, and her community now sees Salazar as a superstar lobbyist. Salazar helped successfully protest an elementary school district change that would have forced children to attend a different campus over a mile away from their current school, which is only blocks from their neighborhood. She rallied parents to collect 6,000 petition signatures and share their grievances with the school board. Dorothy Richardson Resident Leader Awardees and their nominating organization (Salazar was nominated by PSHH staff members Audra McCue and Alejandra Mahoney) received scholarships from NeighborWorks America (NWA). In addition, NWA covered all travel expenses to attend the National Community Leadership Institute in Ohio, where award recipients were recognized at a special awards ceremony. NWA also provided a $5,000 grant to PSHH to support ongoing resident leadership development. As a chartered member, Peoples’ Self-Help Housing is proud to be part of this nationwide collaboration. Founded in 1970, PSHH is an award winning non-profit organization that develops affordable housing and community facilities for low-income households and homeownership opportunities for working families and special needs populations, such as seniors, veterans, the disabled, and the formerly homeless. With nearly 1,200 self-help homes completed and almost 1,700 rental units developed, PSHH is the largest affordable housing developer on the Central Coast, with offices in San Luis Obispo and Santa Barbara. For more information on Peoples’ Self-Help Housing, visit www.pshhc.org, email communications@pshhc.org or phone (805) 781-3088.